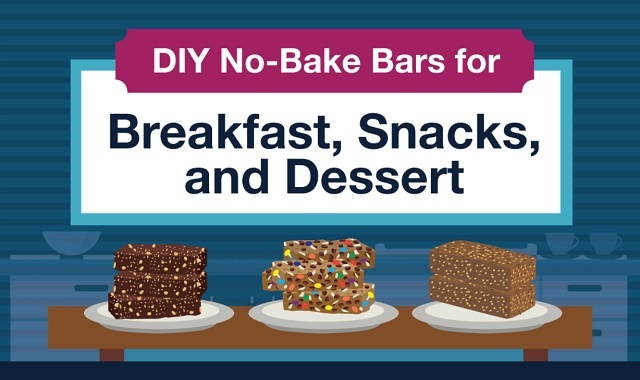 DIY no-bake bars for breakfast, snack, and dessert #infographic ~ Visualistan '+g+"
If you’ve ever skipped breakfast in favor of a few extra minutes of sleep, you know how it feels to be hungry at work. And if you’ve ever been hungry at work, you likely know how it can affect your mood, productivity, and energy level. Rather than default to the vending machine—and let hunger dictate your breakfast or snack choice—you can be prepared with your own homemade energy bars made with real, whole ingredients such as nuts, seeds, nut butters, oats, fruit, and more. Read on to learn more about these quick, portable, reliable snacks.